Acorn Media Enterprises announced Monday that it will be co-producing a new original series in partnership with all3media for its niche streaming service Acorn TV, which specializes in British content. The co-production agreement will see “Blood,” a Company Pictures drama in association with Element Pictures and all3media international for Virgin Media Television, Ireland, make its North American debut on the streaming service as an Acorn TV Original Series in the U.S. and Canada. The increased focus on exclusive content comes as the streamer faces growing competition in the U.S. from rival service Britbox. Launched in March 2017, Britbox, which is the product of a joint partnership between BBC Worldwide and U.K. broadcaster ITV, has already accumulated over 400,000 subscribers. While this still puts the company behind Acorn TV’s growing subscriber count, which hit 450,000 at the start of 2017, it is a sign of significant growth for the service that had just 250,000 subs at the end of February. In an effort to continue this growth, Britbox is also increasing its focus on original content. In February, Britbox President Soumya Sriraman announced plans to increase investment in both original and acquired British programming and make a change in its marketing investment to increase awareness of the service. Outside of the U.S. and Canada, “Blood,” which was commissioned by Virgin Media Television, will not be exclusive to Acorn TV. Virgin Media Television in Ireland will have the global premiere for the show which is expected to take place this Autumn, and Channel 5 has signed a pre-sale deal with all3media international which sees the broadcaster launching the series on linear in the U.K. The new Disney era of “Star Wars” is well known at this point for its incessant nods to old “Star Wars” movies, and “Solo: A Star Wars Story” is the most referential of these movies yet. Below you’ll find our list of 22 times “Solo” reused, repurposed or just referenced the original “Star Wars” trilogy. The entire plot is identical to Han’s predicament with Jabba the Hutt — Han’s situation in “A New Hope” is that he’s on the hook to Jabba the Hutt for a lot of money. That’s because Han was smuggling some cargo, but when he ran into an Imperial inspection, he dumped the cargo to avoid getting caught. He hopes the money he’ll get from ferrying Luke and Obi-Wan to Alderaan will be enough to pay off his debt to Jabba, and he intends to take his reward money to the gangster at the end of the movie — but he winds up staying with the Rebellion to help his friends instead. Never paying off that debt haunts Han throughout the original trilogy, as it happens. “Solo,” meanwhile, has that exact same situation but with Dryden Vos instead of Jabba. The Maelstrom recalls the asteroid field of “The Empire Strikes Back” — After pulling the heist on Kessel, Han and his crew have to escape through the massive cloud that blocks the planet off from the rest of the galaxy, but they’re blocked by an Imperial Star Destroyer. Han takes the Falcon through the cloud (and past the huge scary rocks and ice chunks therein) in order to escape TIE fighters — a trick he also pulls in “The Empire Strikes Back.” With Beckett in the Falcon’s turret, it also evokes Han’s escape from the Death Star in the original film — and the score reflects both of those influences by essentially mixing together the music that played over those two sequences. Chewie’s not great at holochess — Back when audiences first met Chewbacca in “A New Hope,” one of the first things we saw him doing was playing a holographic chess-like game with R2 on the Falcon. The game, dubbed Dejarik, has two players competing against each other with a group of hologram monsters, similar to chess pieces. Beckett teaches Chewie to play the game in “Solo,” and in fact, he uses the same move on Chewie that R2 will use on him years later. In both cases, Chewie isn’t too happy about the situation. Chewie actually rips off some arms — “A New Hope” lets us really start to get to know Chewbacca in the holochess scene with R2-D2, and we get a sense of his physical prowess from Han. When R2 beats Chewie at holochess, Han warns that beating a wookiee can be fraught with peril because wookiees will often get mad and tear people’s arms off. Han gets some first-hand knowledge of Chewie’s proclivity for dismemberment during the Kessel heist, when he and Chewbacca pose as slaves. When they break free of their guards, Chewie shows Han just how much you should worry about your arms when you upset a wookiee. Later in the movie, Han uses the threat of Chewie de-limbing someone a second time, so it’s definitely something he’s taken to heart. Han decides to help the rebels instead of running off with cash — In both “Solo” and the original “Star Wars,” Han has managed to do what he needs to in order to pay back a crime lord who’s mad at him (Dryden Vos now and Jabba back in the day). But both times he chooses to help out some new rebel friends instead — in “Star Wars” by helping Luke blow up the Death Star and then joining the fight, and in “Solo” by giving up his score to Enfys Nest. Han shoots first — Back in the original “Star Wars,” Han shot Greedo straight up in the Mos Eisley cantina, but George Lucas digitally altered it in the 1997 special edition to make it so Greedo himself got off a shot first to make Han seem nicer or something. “Solo” ends with a similar moment. After Beckett steals the coaxium, he tries to keep Han talking long enough to sneak his gun out to shoot Han. The smuggler doesn’t give Beckett the chance, though, and shoots him in the chest before Beckett can make his move. Dying, Beckett confirmed that Han made the right choice by saying that he would have killed Han if he’d gotten the chance. LOL. Han pretends to be mad at Lando — When Han reunites with Lando after years in “The Empire Strikes Back,” Lando at first greets Han and his friends with anger. “You’ve got a lot of guts coming here after what you pulled,” Lando says when he greets Han at the landing pad — but then turns the whole thing into a joke, laughing and embracing his friend. 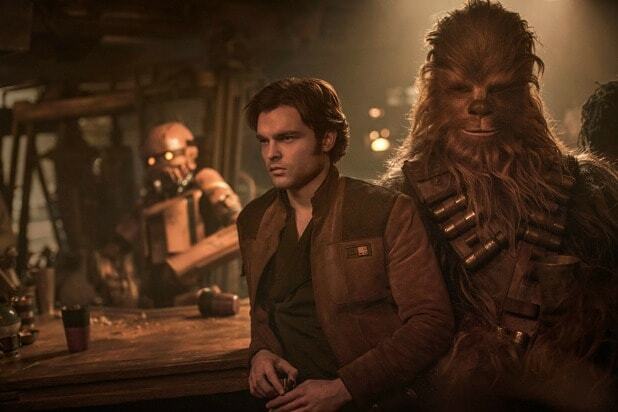 “Solo” calls back the moment when Han and Lando meet again after the heist. Lando greets Han warmly, hoping to keep him from blowing up his gambling scheme. Han at first acts mad, then flips the greeting into a joke and hugs Lando (but also swipes the card Lando used to cheat him in their first Sabacc game). Lando and Han: “I hate you.” “I know” — Probably the second-most-famous line in all of the “Star Wars” films (after “I am your father”) is Han’s forlorn answer to Leia when she says “I love you” in “The Empire Strikes Back”: “I know.” It’s a perfect mixture of arrogance, understanding, love and fear, and Harrison Ford famously improvised it on set when “I love you, too” wasn’t working. “Solo” recalls the best line in “Star Wars” with a great moment in the early, adversarial relationship between Han and Lando. After nearly wrecking the Falcon escaping the Imperial blockade at Kessel, Han and the crew land at the coaxium refinery. Lando and Han have a moment to look at the ship, in which Lando tells Han, “I hate you.” “I know,” is Han’s grinning answer. “I’ve got a really good feeling about this” — It’s become a running joke that every “Star Wars” movie includes the line “I’ve got a bad feeling about this,” stretching through the original trilogy and into the prequel trilogy. When Disney and Lucasfilm started making new “Star Wars” movies with “The Force Awakens,” the joke remained. “Solo” riffs on the gag a bit, with Han reversing it. When he’s about to take the Millennium Falcon into the Maelstrom, he remarks, “I’ve got a really good feeling about this” with a smile. Beckett wears Lando’s rescue getup from “Return of the Jedi” — When Han and his crew head to Kessel to steal hyperfuel, they need to slip into the mining facility without any alarms being raised. To do that, they don a few disguises. Beckett puts on a guard uniform with a weird helmet and a face covering sporting some snaggly teeth, and poses as security for Qi’ra (Emilia Clarke). It’s the same outfit that Lando wore in “Return of the Jedi,” for basically the same idea: Lando sneaked into Jabba the Hutt’s palace posing as a guard. The object of the heist was a little different, though — Lando and the gang had to steal Han himself back from Jabba. Thermal detonator gag — Near the beginning of “Solo,” Han faces down the scary worm person Lady Proxima by holding up a rock and pretending it’s a thermal detonator, mirroring the moment from “Return of the Jedi” when Leia, disguised as a bounty hunter, does the same thing with a real thermal detonator in Jabba’s palace to get Jabba to agree to the price she wants for handing over Chewbacca. The communications dish on the Falcon gets torn off — When the Falcon is racing away from the black hole known as the Maw in “Solo,” the satellite dish on top gets ripped and falls into oblivion, mirroring the moment from “Return of the Jedi” when Lando bumps the top of the Falcon against the interior of the Death Star, knocking it off. Stormtroopers say “Move along. Move along.” — “A New Hope” is pretty slow about introducing the Force to the movie. We first see it deployed by Darth Vader to choke out one of the Imperial brass who insults him; the second time, it’s Obi-Wan Kenobi using the “Jedi mind trick” to mess with the heads of Stormtroopers. When Luke, Kenobi and the droids arrive at Mos Eisley spaceport on Tatooine, they find the troopers searching for R2-D2 and C-3PO. Kenobi short-circuits their attempts to question Luke, telling them, “These aren’t the droids you’re looking for,” which the trooper immediately parrots back to him. Kenobi’s last suggestion is “Move along,” which the stormtrooper then says back to him as a command. A stormtrooper hassling travelers at Coronet spaceport on Corellia uses the same phrase in a similar context in “Solo,” calling back Kenobi’s iconic moment. The Marauders use Darth Vader’s homing beacon trick on the Falcon — After Han and Luke rescue Princess Leia from the Death Star, Leia is the only one who knows what’s really going on. She immediately realizes that Darth Vader and Grand Moff Tarkin allowed the heroes to escape so that they could use a homing beacon to find the hidden Rebel base. In “Solo,” Marauder leader Enfys Nest pulls the same trick, tracking the Falcon after it escapes so they can intercept them and steal their cargo after the Kessel heist. They run the wookiee prisoner gag on Kessel — Speaking of the heist on Kessel, Han and Chewie use a plan that will also work a little later when they board the Death Star in “A New Hope.” (It’ll also be part of the deal when Han’s buds look to bust him out of Jabba’s palace.) The pair pose as slaves to be sold, with Qi’ra giving them fake shackles to wear. Later, they bust out of the cuffs and take down their guards so they can be free to sneak through the mining facility. Luke and Han pulled the same trick with Chewie on the Death Star in order to get into the detention level to free Leia. C-3PO, R2 and Chewie all also were presented as slaves to be sold to Jabba in “Return of the Jedi” to get them into the palace for Han’s breakout. Lando mispronouncing Han’s name — The correct way to pronounce “Han” is like “on,” but in “Solo” Lando pronounces it more like “hand” without the “d.” The movie plays it like Lando is trying to get under Han’s skin while they’re playing sabacc. This is presumably a nod to how Billy Dee Williams pronounced it in “The Empire Strikes Back” and “Return of the Jedi” — though it doesn’t quite work because Leia and C-3PO also also mispronounced his name that way at times during “Empire.” Anyway, whatever, it’s a thing. The Falcon’s “alluvial dampers” — In “The Empire Strikes Back,” Han gets a chance to shout about weird, random ship components as he and Chewie are trying to fix the Falcon’s hyperdrive as it flees an Imperial Star Destroyer. Among the mechanical parts Han mentions but are never expounded upon are the “alluvial dampers,” which Han suggests Chewie check as they try to fix the hyperdrive. Since “Solo” loves making characters say “Star Wars” words for no real reason, when Lando runs down all the cool things about the Falcon he mentions that he had alluvial dampers installed on the ship — although we never learn what they’re for. There is some explanation of the component in ancillary material, though. The comic “Princess Leia, Part I” suggests that alluvial dampers are a necessary component for at least some ships to go to hyperspace. Smuggling compartments — The secret compartments beneath the deck in the Falcon of course made an appearance in “Solo,” though not really for smuggling exactly, as they aren’t exactly pretending to be innocent since the battle on the ground is already in full swing. Han and co. store the containers of coaxium from Kessel in them as they escape the planet through the Maelstrom. In the original film, Han, Chewbacca, Luke and Obi-Wan hide in them to avoid detection when the Falcon is tractored into the Death Star.